I was excited to be returning to the Falkland Islands for a fourth time, keen to watch once again the large numbers of penguins – especially those cheeky gentoos – returning from their fishing expeditions. It is impossible to describe the athleticism as they come ashore, surfing the waves on luminous orange feet, or launching into mid-air before they tumble onto the sand, scrabbling to stand and then shaking themselves off. Shivering at the water’s edge on Carcass Island, I stood near a knot of elephant seals, the bull’s snores piercing the air, and watched for the waves to disgorge the penguins from the turquoise waters. But as I scoured the breaking waves, the incoming gentoos started to abort their approach, suddenly realising an intruder was obstructing their preferred stretch of beach. Me. In the blink of an eye all hell broke loose. A solitary gentoo penguin was zipping through the shallows, just metres away. With camera at the ready and hoping for a penguin emergence right by my feet, I detected movement on the sand. In a burst of fury and moving at a rate of knots, the bull elephant seal had woken and decided I was not welcome on his patch. He was galloping my way, a giant with conflict on his mind. At that precise moment a pocket rocket exploded from the waves right in front of me, at head height. 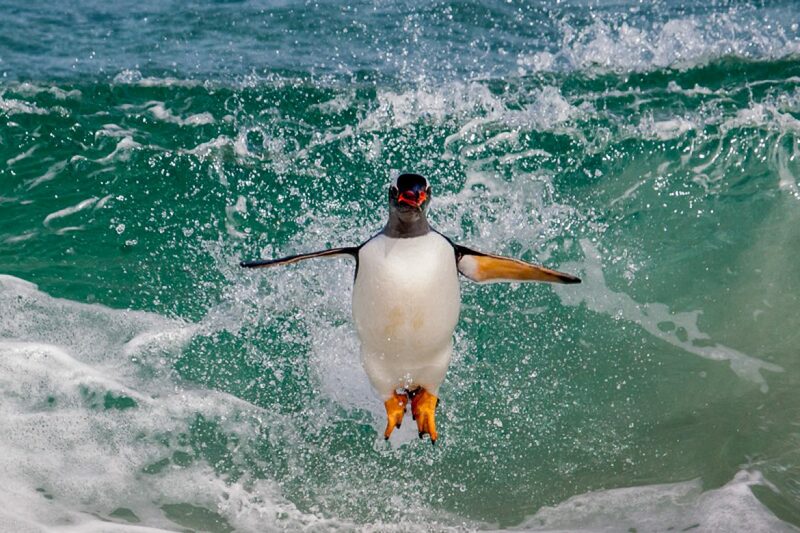 The soaring gentoo was committed, and I was in the way. With elephant seal bellowing as he hounded me off the beach, I managed to snap off just one impossible shot of the airborne gentoo before hotfooting it off that strand as fast as my legs would carry me. I never did manage to get back onto that stretch of beach – the beachmaster had it covered. Whenever I look at this gentoo image and the shock on its face with me in its path, it immediately conjures up the sideshow of the elephant seal thundering from the wings. At least the photograph gives me a chance to revisit that perfect penguin emergence about which I had been dreaming for years!